It is perfectly natural for growing children to prefer the taste of things that are sweet over those that are savoury. In fact, one study conducted in the United States in 2009 found that the faster children grow the more they prefer sweet tastes. 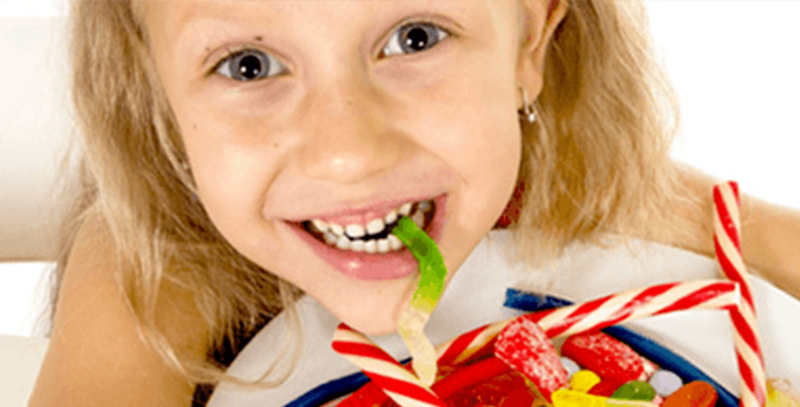 However, although children may have a much sweeter tooth in their formative years, it does not take away the fact that eating too much sugar is bad for them and can lead to health problems now and in the future. These include obesity, diabetes and dental cavities. Filling up with sugary treats means that children are less likely to get the essential nutrients needed for healthy growth and development. We’re not suggesting that you should ban all treats for your youngster, as this is impractical and unnecessary – there’s no need to ban candy and sweet snacks completely. Bans tend to have the opposite of the desired effect by making such foods seem even more attractive. However, it’s important to work out how you can keep treats as exactly that – a treat, as good habits that are formed early can be carried on into the future. The old parental instruction to children “you can’t eat your dessert until you’ve finished your main course” might work at the meal table as a way of forcing children to eat what mums and dads want them to at that particular moment, but it can have negative consequences on their perception of food for the future. Foods that are treated as a reward can be viewed as being more important than those that aren’t. The best approach is to treat all foods the same and a normal part of everyday eating. Instead of forcing your child to eat their main course in return for a dessert, tailor the dessert you give them according to what they have eaten for their first course. If they have eaten just their meatballs and have left their vegetable serving uneaten, offer slices of healthy fruit for dessert to make up for it. If they have eaten everything on their plate, they can have a chocolate biscuit or a piece of cake. If your child asks for more treats after finishing the dessert or sweets, tell them they can still have something to eat, but not a sugary snack. Offer a sandwich with peanut butter, or crackers and cheese instead. Be firm with this and don’t give in when they insist on having more treats. Remember that you are helping them to grow up to be fit and strong. We now live in an age of mass media, meaning that food manufacturers have a captive audience when they want to promote their products to consumers. Unfortunately, many such manufacturers are now using society’s concerns over health to push their wares onto customers by overstating their supposed health benefits. They may use packaging that contains the words ‘natural ingredients’ or ‘no artificial additives’ which draw attention away from their other unhealthy ingredients. Examples of this are the many fruit and grain snack bars now on the market which, despite having some healthy ingredients, are loaded with sugars. These are usually in the form of sucrose, high-fructose corn syrup (sometimes called corn sugar) and glucose. Many soft drinks that appear to be healthy at first glance are heavily sweetened with high-fructose corn syrup – in fact, this ingredient is the most commonly added sweetener in processed foods and beverages. Take care to read the ingredients label when shopping for healthy alternatives to sweet treats and avoid the ones that claim to be healthy but are in fact packed with unhealthy sugars.